Former House Speaker Newt Gingrich on Thursday called for an illegal immigration policy that falls within "some zone between deportation and amnesty" and is implemented sequentially, without a large, comprehensive bill in Congress. "We have to design a solution to the current problem of undocumented workers which gives us a reason to believe that within five to 10 years, everyone in the United States will be legal," Gingrich said. "We are not going to deport 11 million people." Gingrich made his remarks during an appearance at a Washington conference hosted by The Americano, a bilingual news and commentary web site that the potential Republican presidential candidate founded to promote conservative ideals within the Hispanic community. The former Georgia congressman spoke in detail about how Republicans can attract broader support within the Hispanic community, naming incoming New Mexico Governor Susana Martinez as an example of a Republican candidate who is a "law and order conservative" who "also understood her ability to go out and campaign in the community and to be sympathetic." Gingrich singled out former eBay CEO Meg Whitman's unsuccessful California gubernatorial campaign as an example of one in which a Republican failed to strike the right tone with Hispanics, specifically mentioning Whitman's handling of the flap over her former housekeeper, who came forward as an undocumented worker. "If you look at the Whitman campaign's challenge, I think they didn't understand the context in which dealing with the housekeeper would be seen by most people, and I think that was probably the break point of the campaign," he said. Calling the drug wars in Mexico "more important to the future of the United States than the conflict in Afghanistan," Gingrich said that the United States should increase the amount of attention it pays to Latin America as a whole, stressing the importance of isolating Hugo Chavez in Venezuela and enabling Cubans to usher out the Castro dictatorship. Gingrich also called for easing some visa guidelines for travel to the United States. "We've adopted for political correctness the rule that rather than select out people who are obviously a potential threat, we'll simply harass everyone," he said. "That is utterly, totally irrational. For example, virtually all suicide bombers are young males, so suggesting that a Spanish or Mexican nun should have the same difficulty getting a visa as a Middle Eastern male is crazy. It's literally-it is two plus two equals 7,000." In assessing the 2012 landscape, Gingrich said that President Obama's electoral prospects were "totally unknowable" at this point. "If he learns and listens to the American people, he's in pretty good shape," he said. "If he doesn't learn and listen, he'll be isolated and alienated from the American people. None of us know today which Obama is going to show up over the next 12 months." Gingrich said that he expected Obama to raise about $1 billion for his reelection campaign - a sum that he said the eventual Republican nominee would not need to match, but that the GOP challenger would have to at least "be in the same playing field," in order to compete. 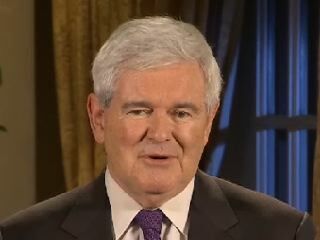 Gingrich has said that he expects to make a decision about whether he will run for president in February or March.